This bronze fountain was given to the town by Stevenage Development Corporation in 1981, and was awarded the Otto Beit Medal. 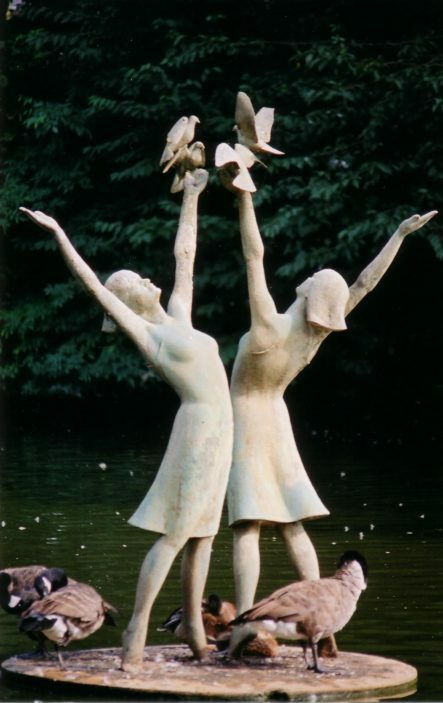 During the regeneration of the Town Centre Gardens in 2011, the statue was cleaned, and four missing doves were replaced. Born in Brazil in 1940, David Norris studied sculpture at the Royal Academy Schools, London. He works in his studio in Putney, concentrating on architectural and landscape bronzes and stainless steel pieces. The human figure and birds feature largely in his compositions. He is a Fellow of the Royal Society of British Sculptors. Recent work includes three stainless steel features for Norwegian Cruise Lines, a bronze figure of Sir William Lyons for Jaguar in Coventry, and a bronze group of swans landing for Procter & Gamble. This is such a joyous piece a delight to see when the fountain is flowing.